First in a new fantasy venture, from the British author of the Mythago Wood series (Gate of Ivory, Gate of Horn, 1997, etc.). Jason, he of the Argonauts, died 700 years ago after Medea murdered his sons Kinos and Thesokorus. Immortal former Argonaut Merlin, reluctant to use his magic because to do so ages him, hears curious tales of a screaming ship at the bottom of a frozen lake in Pohjola (Finland). Barely resisting the advances of the young, seductive sorceress Niiv, who doesn't know her own powers and is all too eager to borrow his, Merlin raises Argo: aboard is Jason, injured but in suspended animation. Merlin awakens Jason, telling him that Medea faked his sons' deaths and spirited them away. Desperate to find the boys, Jason, helped by Urtha, a Celtic chieftain from Alba, and an eclectic crew, rebuilds the ship. Merlin believes that Thesokorus, calling himself Orgetorix, has joined the warlord Brennos intending to lead a huge army against the oracle at Delphi. 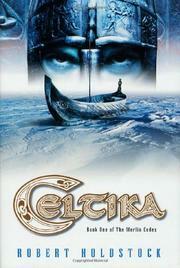 In Alba, though, Urtha finds his wife and children killed by raiders, and swears revenge on the faithless Cunomaglos. Also in Alba lies a weird region known as the Ghostlands, where Merlin glimpses Orgetorix's shade. Can Jason overcome Medea's implacable hatred and find his sons? Can Merlin resist Niiv and still retain his youthful mien? When do we meet Arthur? Does any of this, notwithstanding Holdstock's prodigious and impressive mythological cutting, pasting, and reinvention, really add up? Maybe not, but it astonishes nonetheless: stay tuned.